Eating an entire stick of deep-fried butter is obviously not the healthiest meal option, even though it is the unofficial dish of the state of Texas. When you eat at chain restaurants, selecting the healthy meal choice might not be as obvious as avoiding the deep-fried butter. That's why we've put together a handy list to consult when you go out to eat. We spoke to Kim Larson and Ruth Frechman, registered dietitians at The Academy of Nutrition & Dietetics, to figure out what to avoid ordering at a number of chains. We're pointing out potential red flags on menus you probably see all the time, from Wendy's to Outback Steakhouse. 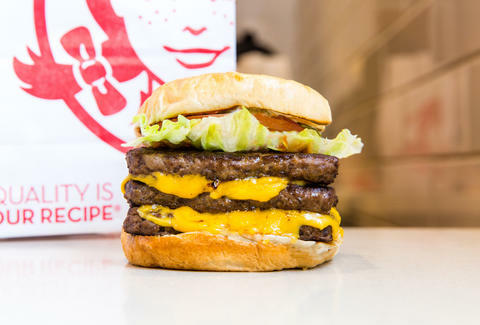 Here are the unhealthiest dishes at every chain. You might have heard that eating a ton of protein is good for you. It is! But moderation is key. "The DoubleDilla contains an excessive amount of calories from protein," Frechman says. "Twenty to 30g of protein in a meal is plenty." And this quesadilla with chicken, jalapeño sauce, and three cheeses has nearly double the amount! We're not going to split hairs here: This is a bummer. Turkey is supposed to be good for you! But dietitians don't get paid to make us feel better about our dietary habits. "This sandwich sounds healthy, but it's really not," Larson says. "It blasts you with an entire day's worth of sodium (2,420mg) from the processed meat, ranch dressing, and bacon." According to the smartypants at Harvard, high sodium is linked to high blood pressure and heart attacks. In fact, it has as much sodium as about 11.5 bags of Nacho Cheese Doritos. But at least it won't leave your fingers stained orange. If you're watching your calorie count, this bacon cheeseburger made with two quarter-pound patties is probably not the sandwich for you. 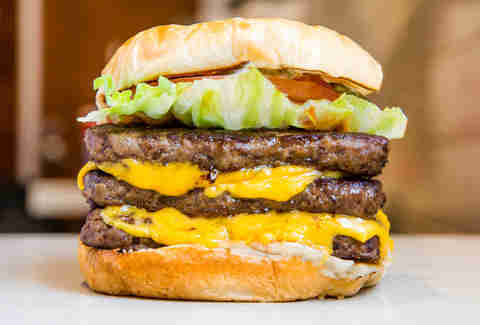 "This double burger spends half of the average person's calories per day (2,000) in one fell swoop," Larson says. "It also supplies almost a day's worth of recommended sodium (2,400mg) in one sandwich." And this sad fact might wipe the smile right off of the King's face: According to Larson, "Eating processed meats like bacon on a regular basis increases your risk of colon cancer by 18%." 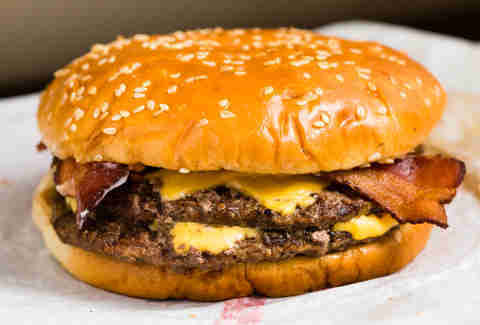 That's right, eating a bacon double cheeseburger is not healthy. Also, the sky is blue and Ben & Jerry's is delicious. "This is the type of sandwich that fuels heart disease if eaten regularly," Larson says. It has an astonishing amount of saturated fat -- eating one burger is the equivalent of taking down seven Krispy Kreme original glazed donuts. She's also troubled by the high calorie count, as one sandwich provides over half of the recommended 2,000 per day. When Larson took a look at the nutritional stats for these ribs, she said they set off alarm bells, not dinner bells. She's especially concerned that the ribs have double the amount of sodium that's recommended for your entire day. And your daily allowance of fat content, too. It's basically like eating nine deep-fried Twinkies! 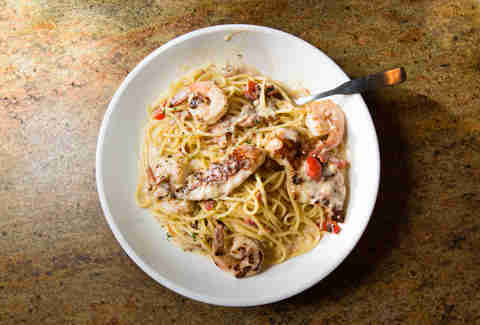 While a dish starring chicken and shrimp might appear to be a healthier meal option at everyone's aunt's favorite Italian spot, it is unfortunately one of the worst choices on the menu. "This entree is deceiving," says Larson. "We normally think chicken and shrimp are lean, low-calorie choices. But not here." This is thanks in part to the cream-heavy sauce. The pasta also has a super-high sodium count. Look, we know you might get mad at us for exposing all these unhealthy food choices, but there's no need to get salty. The towering Factory of Cheesecake is notorious for its giant menu and even larger portions. It might appear that a dish like the the Bistro Shrimp Pasta or pasta carbonara would be the unhealthiest. But ultimately, the plate of gravy and biscuits (with its requisite fat and salt) allowed us to crown this meal the one to avoid. In fact, Larson says its saturated fat levels are more than triple what the recommended levels are to protect against heart disease. If you only have time for one meal a day, this Applebee's meal consisting of three fried fish pieces has your back. "This dish has enough calories for the entire day," Frechman says. Unfortunately, this is also packed with way more fat than you want to consume daily. Taking in too much fat could potentially result in heart disease. "The average American should limit their daily intake to 78g fat and less than 20g of saturated fat a day," she says. Figuring out how much protein you need in a day is not an exact science. But Larson is confident when she says that "no one needs this much protein (71g) in one meal, let alone in one sandwich." In fact, she says that 72g is the entire amount recommended for a 160lb man in an entire day. And to add insult to injury, the sandwich has about as much saturated fat as around 30 strips of bacon. This sandwich has 104% of the saturated fat recommended for anyone on an average 2,000-calorie-per-day diet. And it has all that saturated fat with nary a strip of bacon. What a shame that a two-patty burger with cheese isn't healthy, and it doesn't even have the decency to include bacon on it! While two pieces of chicken might sound like a healthy dinner, looks can be deceiving. "There are sky-high levels of fat and sodium in just two pieces of KFC's chicken because it's breaded and fried," Larson says. The sodium levels are also particularly worrisome. "The general rule of thumb for sodium is to keep meal levels below 500mg, and there's 1,750mg in this single meal." Add in a side like the mac & cheese (830mg of sodium), and you might literally turn into a mountain of salt. Like Biggie Smalls, Larson says prime rib is also "notorious," though in the prime rib's case it's for being "high in fat and calories" and not for being one of the best MCs of all time. 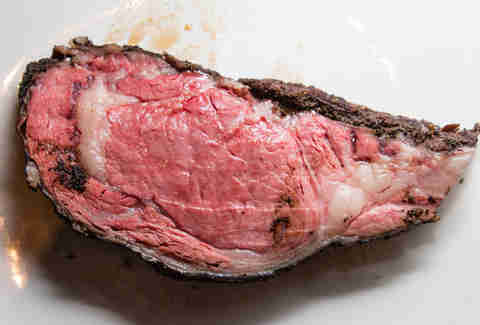 Good prime rib is also Juicy. (Sorry.) Larson's main concerns are that it contains more than two-thirds the calories you need for an entire day and twice the amount of fat. To put it in perspective, it has the equivalent amount of fat as 4.5 Pizza Hut Meat Lover's pizzas. On top of that, the nutritional info doesn't even include the sides you'll inevitably pair it with. Larson was disappointed that a low-calorie, lean protein choice like crab was made super unhealthy. She attributed that to the fact that it was served in a huge portion (check that calorie count!) that had a ton of added fat. Its 1,910 calories is about what you need in a day, and the sodium is almost double the recommended value. Due to the sodium content, Larson says it's potentially dangerous for those who have high blood pressure or kidney disease. While there's nothing fun about high blood pressure or kidney disease, it is fun to say the word "linguini." We could say that word all day and never get tired of it. Ling-weeeeeenie. Surprisingly, it's a side dish at Panda that is one of the unhealthiest items on the menu and not a meaty main like the Beijing Beef. "The chow mein has more calories and sodium than the entree options," Frechman says. She's right -- the chow mein has nearly double the amount of sodium than the chain’s eggplant-and-tofu entree. In fact, it's about the same amount of sodium as eating about 80 Snyder's of Hanover mini-pretzels. Better get a glass of water if you're going to tackle this dish. Lee Breslouer is a senior writer for Thrillist, and is never eating out again. Follow him to home-cooked meals @LeeBreslouer.